Oh what talented people we have in the SCPCUG! Janet McCain's web site (http://www.bv.net/~jmac) has been added to our SCPCUG Member Home Pages (http://www.scpcug.com/memhome.html). I thought I knew a thing or two about web page design, HTML (Hyper Text Markup Language), and Paint Shop Pro. A visit to Janet's site soon convinced me otherwise. This lady is an expert. The design of her web site is all a personal web site should be. It has something of interest for everyone. Exactly what is needed to keep folks coming back for another visit. She tells a little bit about herself, has a Family Photo Album, and goes on to provide info and links on things like gardening, cooking, etc. Janet's biggest interest is Paint Shop Pro (PSP). At her site you will find several tutorials on Paint Shop Pro 5 (http://www.bv.net/~jmac/tutor) as well as "Picture Tubes" for the program. Janet also has links to other PSP resources including tutorial links for the brand new Paint Shop Pro 6 beta. Janet belongs to a number of organizations including the HTML Writers Guild, PSP Users Group, and PSP Interactive Zone. A visit to Janet's Business Page (http://www.bv.net/~jmac/design/ayli.html) and it's links, again shows why I am so impressed with this lady. You see, Janet designed the web sites for the Melbourne and Melbourne Beach Police Departments and the Town of Melbourne Beach. In my August column I discussed the Chillisoft Videomail program which is a $15 shareware program available at http://www.chillisoft.com.au/. Chillisoft VideoMail is designed for ease of use in sending video (or audio-only) mail messages using the RealMedia format. As such it's audio compression codecs are designed primarily for voice. I tried recording some music and it sounded terrible. Now I had heard music on the web recorded in the RealMedia format so the question was what program were they using? Why not go to the source, RealNetworks (http://www.real.com/)? Sure enough RealNetworks has the tool required. It's called RealProducer G2 available at (http://proforma.real.com/mario/tools/producer.html) and it is free. There is also a Plus version for $149.95 and a Pro version for $499. The free version should be more than adequate for any of us amateurs wanting to add a RealMedia type video/audio message to our Home Page or send a video/audio mail message. RealProducer G2 is a bit more complex and does not provide the simplicity of Chillisoft but therein lies it's strength. It has much more flexibility in the way of settings. This is a first class professional type program that keeps getting better with each revision. Click on the above graphic to download and play a sample 70-second video in Slide Show format. Content is from the May 99 SCPCUG meeting at Viera where Microsoft gave the Guest Speaker Presentation. If you attended this meeting you may see yourself. When you go to the link cited above to download RealProducer G2 their is a dropdown arrow list offering several versions of the program. I originally downloaded the ver 6.0 gold which installed and worked without a hitch. When I decided to write this article I found that ver 6.1 gold had become available so I downloaded the almost 4 MB file so I would have the latest to write about. Now what do I do? Overwrite the existing version with the new version or remove the existing version and do a clean install of the new version. Decisions like this always leave me with mixed emotions and most of the time the program developer never tells you which is the best way to go. Logic would say it is probably safer to uninstall the old version first before installing the new version. That's the route I decided on. I used CleanSweep (http://www.symantec.com/sabu/qdeck/index.html) to remove the old version. I then installed the new version without a hitch. Next step was to try it out by recording a short video. No problem. The program said I successfully converted an avi file to the RealMedia (.rm) format. I pressed the Play button on the RealProducer G2 to see my recording and got an error message "RealPlay caused an invalid page fault in module rppr3260.dll". Oh no! What happened now? Okay close RealProducer G2. Just try another RealMedia file in RealPlayer G2. Same message. How about RealJukebox beta which ties into RealPlayer G2? It comes up on screen but I can't hear any music. That's broke too! By way of background, after I had installed the earlier version of RealProducer G2, I did two upgrades to RealPlayer G2, the second of which installed the RealJukebox beta. These were those automatic upgrades where the program pops up and says "an upgrade is available", you click a button, and before you know it the program is downloading and installing something somewhere on your hard drive. This is great for convenience and ease of installation but if something goes wrong you are at the mercy of whoever wrote the program and you pray that they put in enough safeguards as to not screw up your computer. So now what? A search of readme files, Help files, Frequently Asked Questions, etc. turned up nothing. It looked like the cause of the problem was with the RealPlayer G2. But could I reinstall it? I had the original file but what about the upgrades that were automatically installed? Going to the "Programs" cascading menu off the Start button in Windows 95 I found within the "Real" folder a shortcut called "RealPlayer G2 Setup". Did setup pertain only to the original download or did it include the upgrades? Luck was on my side. Running the setup installed the original plus the upgrades. RealPlayer G2 and the RealJukebox beta were working again. I hope by the above story I have not caused you to decide on not trying RealProducer G2. My purpose was only to inform so that in case you run into problems you will have at least a starting point. Friends that have installed RealProducer G2 have had no problems so perhaps mine may be a unique case for whatever reason. They say "knowledge is power" so if you want a clear idea of what RealProducer G2 is all about I urge you to first download the RealProducer User's Guide. It's a 1.9 MB download in pdf format (Acrobat Reader required) at http://www.real.com/products/tools/producer/docs.html. Although RealProducer G2 is more complex than Chillisoft Videomail it is not all that difficult. There are recording wizards that walk you through the process for creating a RealMedia output file (.rm format) or doing a live broadcast. 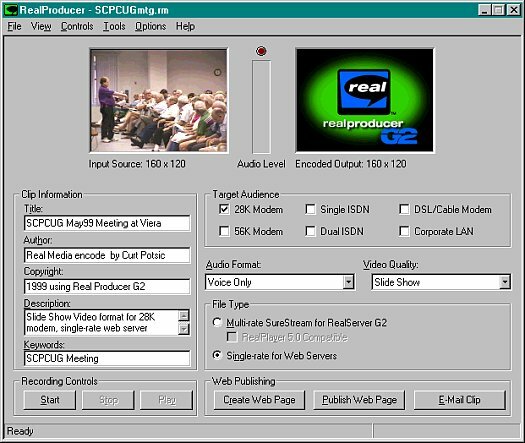 Input sources can be an existing media source-file or a live input media device (microphone and/or video camera, camcorder, vcr, etc. with video capture card). Existing media source-files can be Audio (.au), Waveform audio (.wav), Video for Windows (.avi) or QuickTime for Windows (.mov). Note the mov format requires you to have DirectX 6.0 installed on your machine. You can decide on a number of format settings for audio and video separately which changes the compression settings accordingly. Audio Format selections include: Voice Only, Voice with Background Music, Music, Stereo Music, and No Audio. Video Quality selections include: Normal Motion Video, Smoothest Motion Video, Sharpest Image Video, Slide Show, and No Video. You can select your Target Audience which ranges from a 28K Modem to a Corporate LAN (Local Area Network). The 28K Modem will give you the maximum compression and smallest file size. Selecting "Voice Only" and a 28K Modem Target Audience will give you a 16 Kbps recording with a audio frequency response of 8 KHz. A little trick I learned was to go to the RealProducer G2 Menu, click on Options | Target Audience Settings | for Audio Clips..., and select "Multimedia Presentation" under Audio Mode. This changed the audio setting from 16 Kbps to 8.5 Kbps. The frequency response dropped to 4 KHz but was quite adequate for voice. The advantage was a decrease in the resulting output file size which might come in handy for sending long audio-only e-mail messages. Another way to keep file size down is to select "Single-rate for Web Servers" rather than "Multi-rate SureStream for RealServer G2". Selecting the SureStream route allows you to incorporate more than one bit stream into the output file at the expense of a dramatic increase in file size. For example the SureStream output could include two separate bit stream rates, one for those with 28K modems and one for those with 56K modems. When I first started playing with RealProducer G2 it escaped me as to how such a fine program could be free. A look at a screen such as that mentioned above revealed why. Although the audio setting came up as 8.5 Kbps there was a dropdown arrow next to it which revealed 20 other settings ranging from 5 Kbps Voice to 96 Kbps Stereo Music. Clicking on any of them said I must upgrade to RealProducer Plus ($149.95) to enable that feature. You will find other limitations of the free version on other screens such as being tied to a max frame rate of 15.0. The plus version allows you to vary a slider from .25 fps to 30 fps. You are also locked into emphasizing audio over video in a degraded bandwidth condition. All of these limitations should not seriously affect us amateurs. By allowing only selected defaults Real Networks has just made our life simpler. One setting I found quite unique and useful was the Video Quality setting called Slide Show. It allows you to take an existing avi file and convert it into a slide show. Essentially the program captures a video frame from the avi file approximately every 5 seconds. Each captured frame remains on screen for 5 seconds before cutting to the next. The original avi file's audio is transferred without change. The advantage is a much smaller output file since it is a series of still frames rather than continuous motion video. The clarity is improved since the compression needed for video motion is not used. Since the file size is so much smaller this provides an opportunity to increase the image size say from 160x120 pixels to 320x240 pixels without an unacceptable file size increase. The RealProducer G2 program allows you to save your output file as an e-mail clip. By the click of a button it will bring up your e-mail client ready for you to fill in the "to" e-mail address. RealProducer G2 also allows for creating a web page with your clip embedded and publishing it to the web. It can set your RealMedia file to come down as streaming audio and/or video. The streaming part was something I had been curious about for a long time. Next month I'll discuss how it's done. The process is deceptively simple. For now, if you want an example of streaming audio go to our SCPCUG Home Page at http://www.scpcug.com and play the "Welcome Message".